Cables, texture, a cozy collar to keep out the chill - what could be better for the cool early mornings of late summer or the crisp afternoons of autumn. 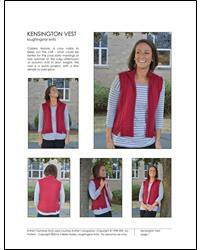 Knit in aran weight, this vest is a quick project, with a few details to add spice. Project Size: Finished Bust: 32 (34, 36, 38, 40, 42)(44, 46, 48, 50, 52)". Stitch Count: Gauge: 18sts/24 rows = 4" in stockinette, using size 8 (5mm) needles, blocked.